Our good friend Mike Kojima at MotoIQ did an awesome review of the new Crawford Performance FR-S/BRZ Power Blocks Intake Manifold Spacers. Check it out! Last week we got a text message from Subaru tuner extraordinaire Quirt Crawford. Quirt was pretty excited about one of his company’s, Crawford Performance’s new products, a set of Power Blocks intake manifold spacers for the Scion FR-S/Subaru BRZ FA20 engine. Quirt told us that in their testing these spacers made a remarkable power difference in the notoriously fickle and difficult to tune FA20 engine. The spacers would make a big difference in area under the curve said Quirt and he then arranged to ship us a set. We were somewhat sceptical but were eagerly awaiting the parts’ arrival at the palatial MotoIQ Megashop. In the meantime we located a bone stock Subaru BRZ in order to perform our testing. 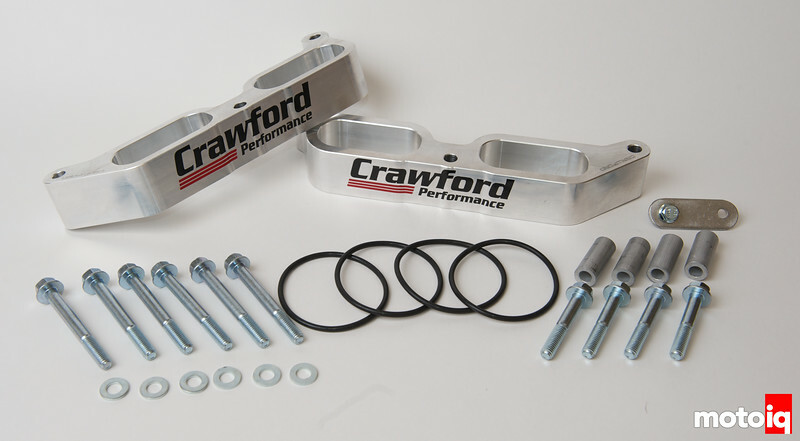 The Crawford Performance Power Blocks intake manifold spacers are CNC machined from billet aluminum and raise the intake manifold up over an inch. 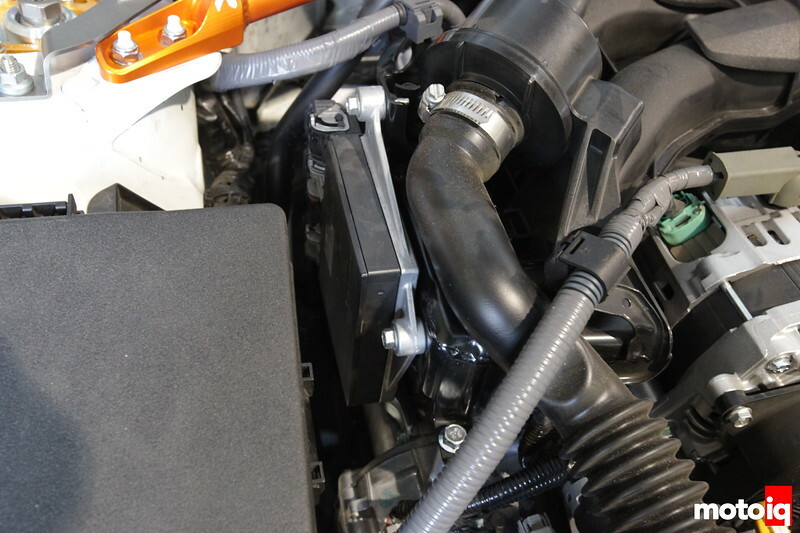 This lengthens the intake manifold runners which increases the runner volume and lowers the rpm where they resonate. Lengthening runners typically helps low end power at the expense of top end power. The kit comes complete with all the stuff you need to perform the install including longer bolts and O-rings. 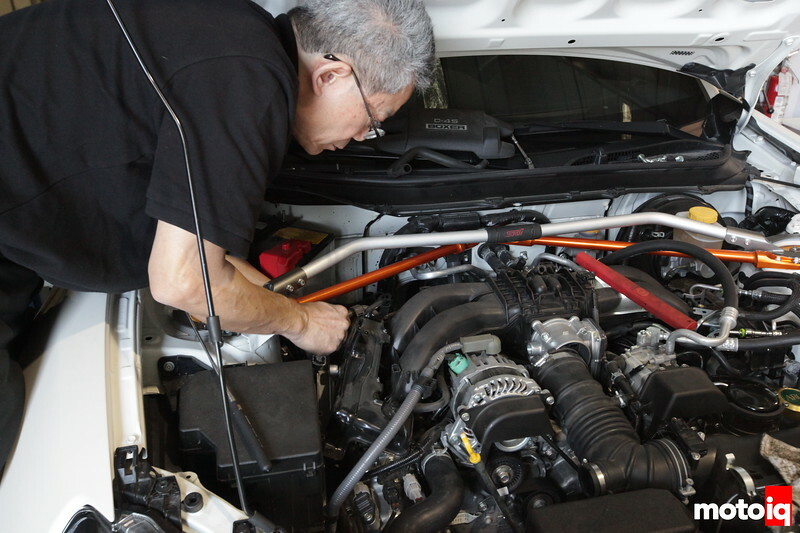 Howard Watanabe starts off the install by removing everything on the intake manifold, all the lines, intake tube and wire harness clips. He also removed the stamped steel noise covers from the injectors. 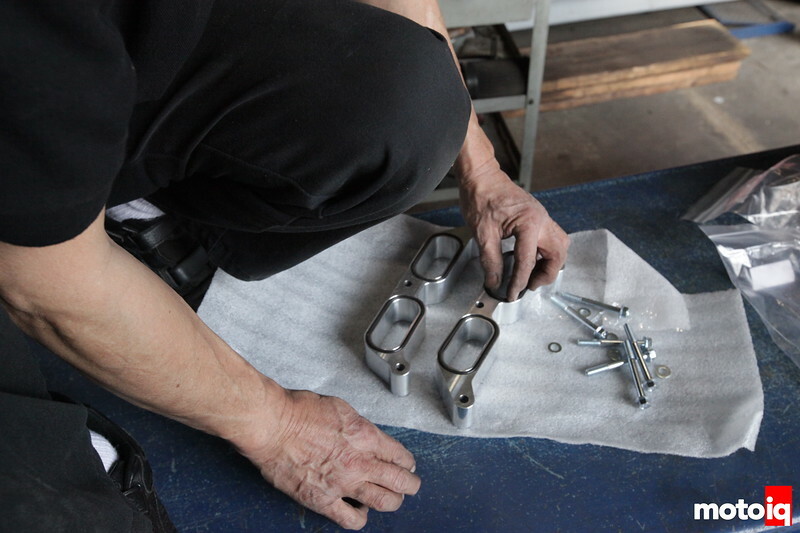 Howard places the supplied O-rings into the machined grooves in the Crawford Power Blocks. The grooves are tight so the O-rings stay in place. 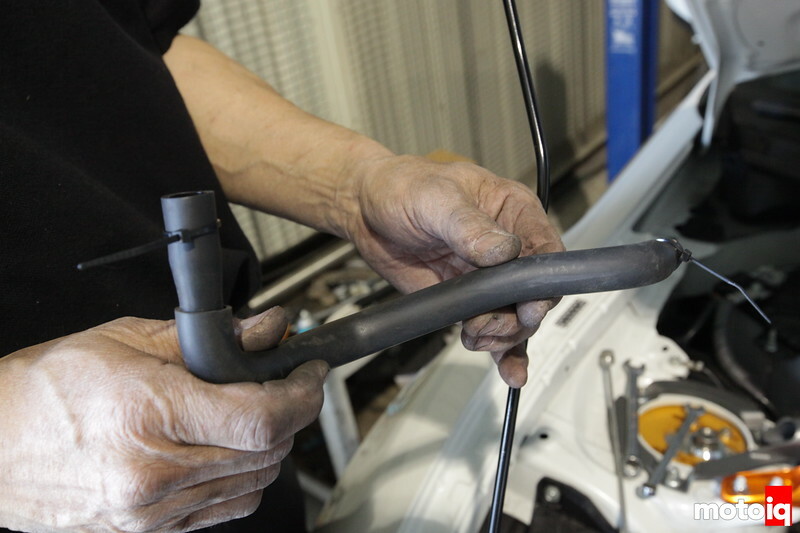 The stock intake gasket has molded in rubber sealing rings and can be reused so we simply put that back in place between the spacer and the stock manifold. We unbolted the direct injector high voltage driver box from the intake manifold and the block. With that we were ready to install the spacers. 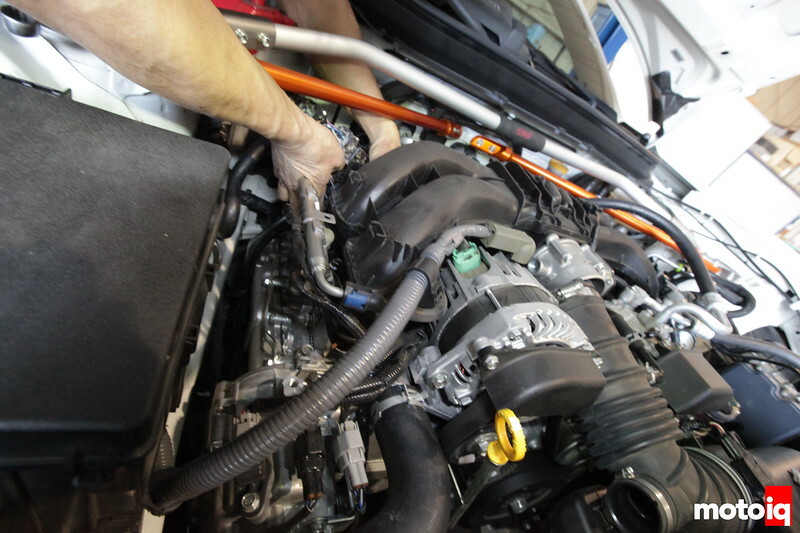 If you have a set of helping hands available, it is useful if you can get someone to lift the intake manifold up while you slip the Power Blocks in place. Howard is badass and doesn’t need helping hands. Be sure you don’t knock the O-rings out of place or you will have an epic vacuum leak and all sorts of DTC codes as a result that will drive you nuts. The Crawford Performance Power Blocks intake manifold spacer in place. Howard bolts the manifold back down and reinstalls everything. The PVC line is loosely slipped onto its fittings and pops off super easily. Believe it or not, it has no clamps from the factory. Since it has more tension on it now with the taller manifold, we zip tied it in place to keep it from perhaps popping loose. The injector driver box now sits higher so one of the mounting bolts to the engine’s block won’t line up. 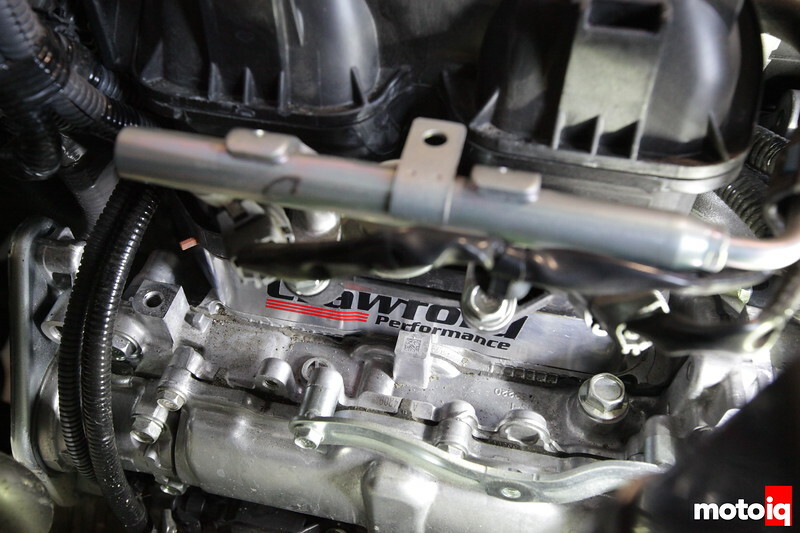 Crawford Performance includes a small bracket to extend the mount so all the bolts can be used. Everything is all buttoned up and ready to go. It looks all stock except the intake manifold is now much higher. Most strut tower braces will still clear. Note we did not try every STB on the market so please don’t ask if your’s will! We are now ready to dyno. Our install time was about 30 minutes. Your experience may vary but we took our time and taking pictures wasted some time as well. To be fair, we are somewhat used to taking the manifold on and off on this engine as we have done it a few times. The results! 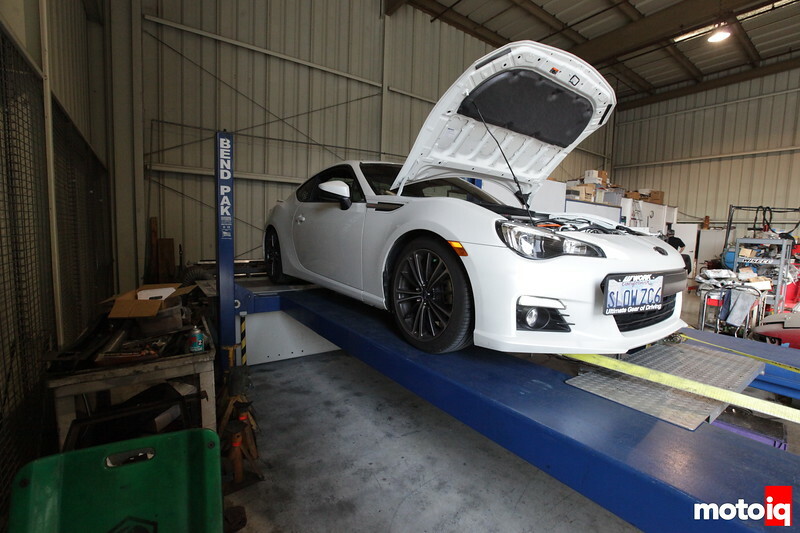 At 148.2 wph and 118.3 lb/ft of torque, this BRZ is the most powerful FR-S/BRZ we have yet to test on our conservative Superflow dyno. These cars typically run in the low to mid 140 hp range on our dyno. The Crawford Performance Power Blocks intake manifold spacers made a big difference, the car put out 152 hp @ 6500 rpm, a gain of 4 whp. Torque was 126.2 lb/ft @6200 rpm, a gain of 8 lb/ft. 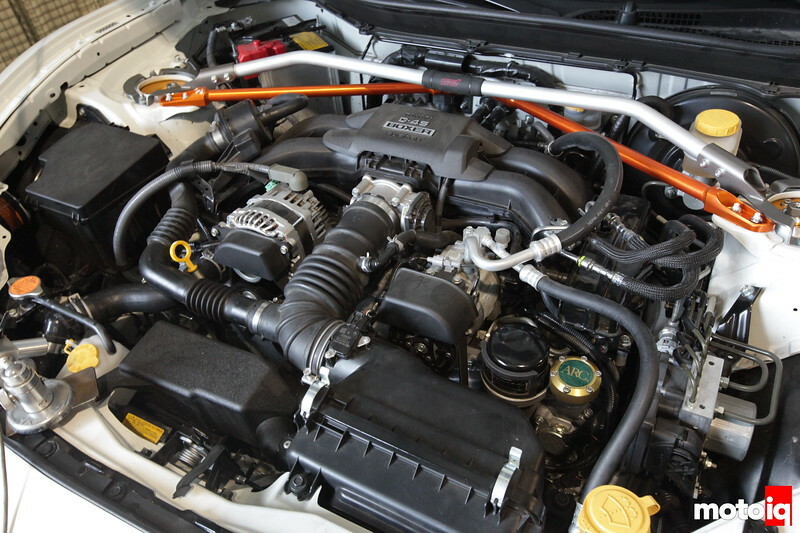 The peak power gain was 11.5 hp @ 6200 rpm and peak torque gains were pretty much 8 lb/ft. The FA20 engine also gained about 2 lb/ft and 4 hp below 3200 rpm. 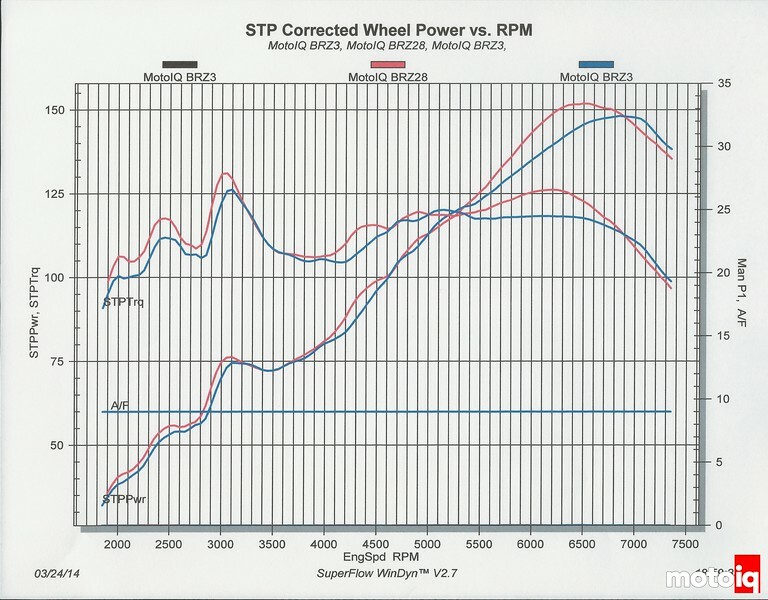 Around 2 hp was lost past the power peak beyond at 6800 rpm. This loss is insignificant compared to the large area under the curve in the useful part of the powerband that the engine gained. We feel that the Crawford Performance Power Blocks intake manifold spacer makes the largest non forced induction power gain of any single part we have tried to date. It is also probably the biggest bang for the buck power gain. Yes, the spacer did lose a tiny bit of power past the peak and the peak is a few hundred RPM lower but when driving the car, we are no longer constantly bumping off the rev limiter as we used to. You can definitely feel the gains of higher mid range power and the car accelerates harder. In the future we will pair the Power Blocks up with an exhaust, header and intake so see if we can get some of the lost very top end back and more.